Alan and Michele Watson from New Zealand were presented with the 2002 DRAGON Award by The J. Marberger Stuart Foundation, Inc. on stage at the grand ballroom of the New York Hilton Hotel at 8 p.m. on July 4th at the S.A.M. Centennial Convention before an audience of over 1400 registered conventioneers. 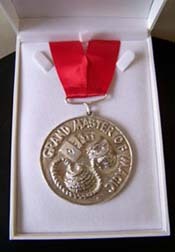 The DRAGON Award is presented in recognition of outstanding teamwork in the art of magic. The award consists of four parts: DRAGON Award medals, the Order of the DRAGON pins, a plaque and a thousand dollar cash prize. Jane Stuart, President of The J. Marberger Foundation, Inc. presented the award to the Watsons. In keeping with the custom of the DRAGON Awards, last year's winners, Paul and Debbie Daniels, welcomed the new winners into the Order of the DRAGON by presenting the medals to Alan and Michele Watson.